It’s been pretty quiet in our small wood, lately. Our Thanksgiving travels and other obligations have kept us from the work for a while now. It has snowed and rained and melted and snowed again, and rained again in that time. The wall isn’t standing yet, and there is a snowstorm predicted for this Tuesday and Wednesday. I’m not altogether bothered by that, as the whole point of having this place where it is is the snow and ski patrol and skiing. I had planned to work two shifts on Tuesday and Wednesday (my standard days) and then shovel out the job-site and stand a wall on Thursday…but, then, I may have to ski again. We’ll see. Our trip to Thanksgiving was productive of something other than fat bellies. My father offered up a block-and-tackle set that he’s had for, oh, at least 34 years. I’m sure he’s found uses for it, but the last thing I remember it for is hoisting cub scouts in a demonstration of mechanical advantage. There may have been an “arrow point” involved for someone. These might help me to avoid an injured back, if I’m patient enough to use them. 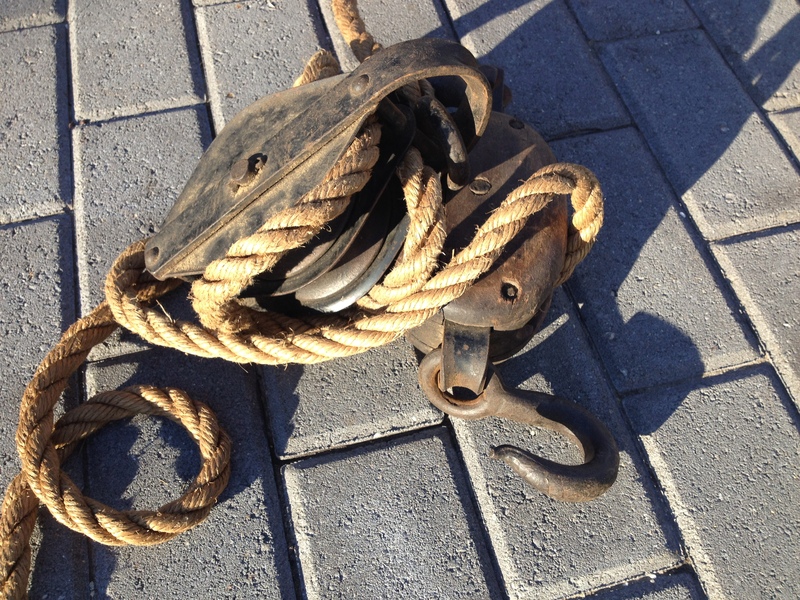 Block and tackle; fundamentals of the game. In the meantime, the place is quiet for nights and days as I am gone. No racket of saw or air compressor, no banging of hammers nor cursing at bent nails. I imagine the platform sitting still under the crust of early snow, nothing moving but wind and trees. Waiting. There is a stillness of people-places that is strange to the world. Only we animate them or give them purpose and life and when we are gone, their air rushes out and breezes creep in. To the squirrels and birds they are weird if convenient intrusions on the landscape. To water, they are easy puzzles that quickly give way to exploratory drops. Stillness is an invitation to decay — or to reclamation, better. If we want to shape spaces to accommodate ourselves, we must be willing to work continually. The moment we stop, edges begin to blur, planes sag, angles distort. Science calls this entropy. Nature calls it her own. The luck is that the world’s time is eternal by comparison to my own, which runs fast. The time I lose begrudgingly that seems like such a big chunk of this winter to me is a nonce to the world. So I can run back to prop up my progress without losing much of it. So with the house empty and the doors locked and the mattresses rolled round, those stray airs, advance guards of great armies, blustered in, brushed bare boards, nibbled and fanned, met nothing in bedroom or drawing-room that wholly resisted them but only hangings that flapped, wood that creaked, the bare legs of tables, saucepans and china already furred, tarnished, cracked. What people had shed and left—a pair of shoes, a shooting cap, some faded skirts and coats in wardrobes—those alone kept the human shape and in the emptiness indicated how once they were filled and animated; how once hands were busy with hooks and buttons; how once the looking-glass had held a face; had held a world hollowed out in which a figure turned, a hand flashed, the door opened, in came children rushing and tumbling; and went out again. Now, day after day, light turned, like a flower reflected in water, its sharp image on the wall opposite. Only the shadows of the trees, flourishing in the wind, made obeisance on the wall, and for a moment darkened the pool in which light reflected itself; or birds, flying, made a soft spot flutter slowly across the bedroom floor.